In an effort to sway voters prior to Nov. 6, district officials on Monday released some details on what they say will happen in local schools should the fall referendum questions pass, as well as what happens if the questions fail. “Failing plumbing and heating and air conditioning; building, staff and student safety, and security issues; students learning in hallways,” are just some of the issues the district has to address, according to a news release from the district. Two district-related questions are on the back of next Tuesday’s ballot. The first will ask for a recurring $3.5 million increase in tax levy, funds which will be used for annual operating costs for programming, technology, and ongoing maintenance. The second question will ask to borrow $75.9 million for safety and security improvements; technology upgrades; Americans with Disabilities Act updates; remodeling and additions for classrooms and academic areas, cafeterias, kitchen areas, receiving and other areas; and deferred maintenance and site improvements. The Nov. 6 results will give the district direction as to how it can proceed with the needed upgrades, or what program cuts it will need to make, beginning with the next school year. If both questions pass, the district can continue to sustain programming, technology and maintenance functions; upgrades to HVAC systems, plumbing, roofing, and security will begin next June, beginning with SPASH, the news release said. If both questions fail, the district will prepare to cut both programming and staff during the 2019-20 district budgeting process. Gerlach said improving safety and security were non-negotiable, but class sizes would likely increase and academic programs would be either reduced or eliminated. “District leaders, school board members, and staff are aware those are real possibilities, but they aren’t delving deep into that potential, not unless voters give that direction,” the news release reads. 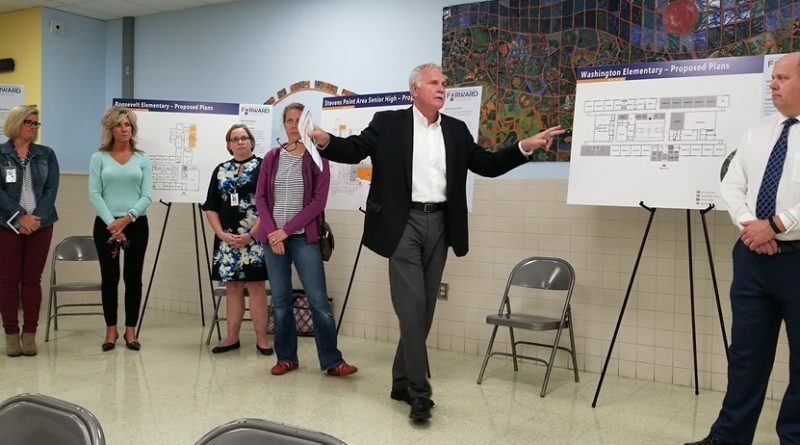 If the operating question passes and the bond question fails, Gerlach said the district will “review bond projects to prepare to go back to referendum in the spring”, but said he expects academic programs would be reduced and class sizes will increase. If the bond question passes and operating question fails, Gerlach said, building projects will move forward, and the district would reduce its operational budget, which pays for programming and staffing. According to County Clerk Shirley Simonis, the $3.5 million question would increase taxes by $77 per $100,000 in assessed value. The $75.9 million question would increase annual property taxes by $69 per $100,000. More information on the Nov. 6 referendum can be found at pointschools.net/referendum.